1. SO CHARLENE, GM OF CLUB WEMBLEY, THAT’S A PRETTY IMPRESSIVE TITLE. CAN YOU TELL US ABOUT THE JOURNEY YOU TOOK TO GET YOU TO THIS POINT IN YOUR CAREER? Funnily enough it was a complete accident. As a big Arsenal supporter, a friend informed me that if I worked for the club on an event day, then I could watch the matches at Highbury. It was only once I got a job on the Arsenal reception desk during events that I realised a career in hospitality was an option. Naturally I jumped at the opportunity to assist in developing the Emirates Stadium premium products when it came up. 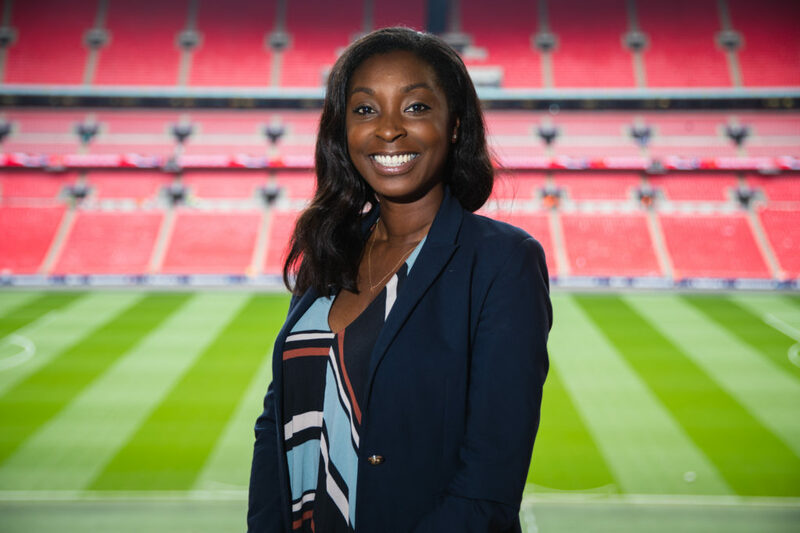 Wembley Stadium is undoubtably one of the world’s most iconic venues, so when I was approached about the General Manager role, I jumped at the chance. Now I have my dream job at the Home of English Football. I’ve been at Club Wembley for half a season now, and I love being part of creating what truly are memorable sporting experiences. My role involves being accountable for all aspects of a Club Wembley member’s journey with us. I feel incredibly fortunate to work across such a fantastic variety of event genres, from some of the nation’s biggest football matches, such as The Emirates FA Cup Final, to other sporting events, like the NFL and Anthony Joshua’s next fight. On top of that we’re part of once-in-a-lifetime music concerts that this year include the Spice Girls reunion and Fleetwood Mac – both of which sold out in minutes! 2. YOU ARE ONE OF THE FEW WOMEN IN A LEADERSHIP ROLE IN THE SPORTS/HOSPITALITY INDUSTRY. WHAT CHALLENGES HAVE YOU FACED / DO YOU FACE IN THIS RESPECT? There are many talented women working in a variety of levels across the sports industry – you just don’t always get to hear about them. But breaking down barriers and overcoming common issues such as representation and discrepancies in income, isn’t a quick or an easy process, especially in what has traditionally been a male-dominated industry. I am confident that steps are being made within the industry to make it more equitable, diverse and reflective of modern society. For example, last January The FA announced a new three-year equality, diversity and inclusion plan called ‘In Pursuit of Progress’ to ensure the diversity of those leading and governing football better reflects what we see on the pitch in the modern game. While change won’t happen overnight, this is a significant step in the right direction to make football more equal and inclusive. In fact, since 2016 The FA has more than doubled the number of senior women – including now having three women on The FA Board! 3. HAVING SEEN THE EVOLUTION OF THE SPORTS INDUSTRY OVER THE YEARS, WE’VE HEARD THAT YOU BELIEVE THE CULTURE OF WOMEN IN SPORT IS CHANGING. WHERE DO YOU SEE THE TRANSITION GOING? You only have to look at the number of people regularly attending women’s sporting events whether it is football, rugby or netball, as well as the increased visibility of women’s sport on national television, to see that the culture of women in sport is changing. There’s still a long way to go, but in the UK women’s sport is thriving, with the recent success of the England Netball team and the Lionesses lead up to the World Cup in France this summer. I remember reading an interesting study just after the men’s World Cup last summer, that found one in five women said they were more excited about the World Cup than their partner. I also saw a separate poll that encouragingly found more girls aged between 6-16 years old, now aspire to be a football player and managers. It’s fundamentally important that women receive as much recognition and respect on the professional front as their male counterparts and hopefully that will continue if television coverage of women’s sports continues to increase. To keep making steps in the right direction we need to continue to celebrate women’s successes, give them the air time they deserve. Equally, as venues we need to ensure Women feel welcome at the events we put on. 4. ANY SUGGESTIONS TO OUR READERS ABOUT PLACES TO VISIT WHEN IN WEMBLEY (ASIDE FROM THE CLUB AND STADIUM, OF COURSE)? Naturally, I would choose Club Wembley’s most recent opening, The Lioness, which is a relaxed gastropub at the heart of the stadium. The space is steeped in history, with its incredible installation of historic photographs, trophies, models, and football memorabilia, showcasing some of the greatest Wembley moments of all time. You can’t help but feel like you’re in a special place. I also love the innovative self-serve beer station, which surprises members every time they grab a pint! If you forced me to leave the confines of Wembley Stadium, there is a diverse range of street food pop-ups in the newly opened Boxpark, which is part of the £3 billion Wembley Park regeneration project. I especially love the variety of activities and DJ’s they have. The London Design Outlet is also right on our doorstep. 5. YOU CERTAINLY KNOW A THING OR TWO ABOUT HOSPITALITY. WHERE ARE YOUR FAVOURITE PLACES TO EAT AND DRINK IN LONDON? 6. WHAT WOULD YOUR PERFECT LAZY SUNDAY IN LONDON LOOK LIKE? For me, if I’m not working on a Sunday, I love nothing more than catching up with family and friends. If I’m not hosting Sunday lunch at home, there will normally be a large group of us with our other halves and children taking over a pub dining room somewhere.